The current shuttle wars were ignited by Delta’s triple-mile promotion for flights between New York and Boston, Washington, D.C., and its newest Shuttle destination, Chicago. American responded by matching the Delta bonuses on its New York-Boston and New York-Chicago routes, and United did the same for its New York-Chicago flights. That left two airlines with significant exposure to the Delta promotion on one or more important routes: JetBlue and US Airways. Surprisingly—because their shuttle competes head-to-head with Delta’s between New York and Boston and between New York and Washington, D.C.—US Airways still hasn’t weighed in with a bonus to offset Delta’s. Through August 31, members of JetBlue’s TrueBlue program will earn triple points—twelve points per dollar spent—for flights between New York and either Boston or Chicago, two of the three routes targeted by Delta in its promotion. They’re also tripling the points between Chicago and Boston, and between Los Angeles and New York or Boston. Triple points trump non-triple points any day. But in this case, travelers have other options as well. The Delta, American, and United bonuses are triple redeemable miles plus triple elite-qualifying miles. JetBlue has no elite program or elite perks, so they can only offer triple redeemable points. That’s a negative in itself, and also points out the difference between the programs of the mainline airlines and JetBlue’s. Members of American’s program, for instance, can earn miles for transactions at more than 1,000 participating companies, both within and outside the travel sphere, both on- and offline. And when it comes to redeeming their miles, AAdvantage members can fly almost anywhere in the world using the program’s extensive network of partner airlines. Members of JetBlue’s program, by contrast, can earn points only for JetBlue flights, charges to the JetBlue credit card, Hertz rentals, and Hilton stays. And they can redeem their points only for JetBlue flights. 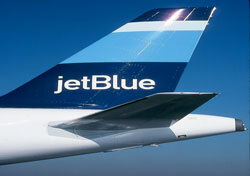 If you’re a JetBlue partisan and would book that airline no matter what, the extra points are a nice windfall. But if you’re brand-agnostic and looking for the best frequent flyer program payoff, JetBlue’s offer is the weakest of the bunch, because its program is weaker than American, Delta, or United’s. Are TrueBlue points as valuable to you as miles in the programs of American, Delta, or United? Would you pay more to earn miles in a more robust frequent flyer program?